The French government revealed a new plan for the deployment of renewable, decarbonized hydrogen energy in the country in June 2018. Nicolas Hulot, the Minister of Ecological and Inclusive Transition at the time, detailed several aspects of France’s long-term goals for the integration of hydrogen into the country’s energy mix. The plan aims to have 5,000 light-duty FCVs and 200 heavy-duty FCVs on the road by 2023, supported by at least 100 refueling stations throughout the country, up from the 20 open in 2018. By 2028, the Ministry expects to deploy 400 to 1,000 hydrogen stations, supporting 20,000 to 50,000 light-duty FCVs and 800 to 2,000 heavy-duty FCVs. The plan also mandates the use of at least 10% renewably-sourced hydrogen by 2023, increasing to 20%-40% by 2028. The French government’s commitment to supporting the development and deployment of hydrogen infrastructure helps to define a path to the country’s low-emission, sustainable future. This plan followed the April 2018 release of a study of the potential role of carbon-free hydrogen in meeting France’s carbon emissions targets supported by FCHEA members Hyundai, Toyota, and French industrial gas provider Air Liquide, among others. According to the study, by 2050 hydrogen could account for 20% of the country’s energy demand, and 18% of transportation needs, resulting in a reduction of carbon emissions by 55 million metric tons, nearly one-third of France’s reduction target under the 2015 Paris Climate Agreement. This significant potential can also spur economic growth as the necessary infrastructure continues to develop: by 2050, the hydrogen industry is expected to create more than 150,000 jobs and €40 billion of annual revenue. However, to reduce the current costs of hydrogen production, the study recommends an €8 billion investment in equipment, infrastructure, and further research and development. These prospects for the development of a hydrogen-society reveal the benefits, economic and environmental, of adopting a clean, sustainable energy source. Companies including Air Liquide, automakers like Toyota and Hyundai, and other industry partners have been leading the adoption and development of hydrogen fuel in France. In December 2017, Air Liquide opened a refueling station at Paris-Orly International Airport, the first located at a French airport. The station was developed with Groupe ADP, the owner and manager of Paris’ three international airports. Hype, the world’s first fuel cell vehicle (FCV) taxi fleet, was launched in partnership with Air Liquide. 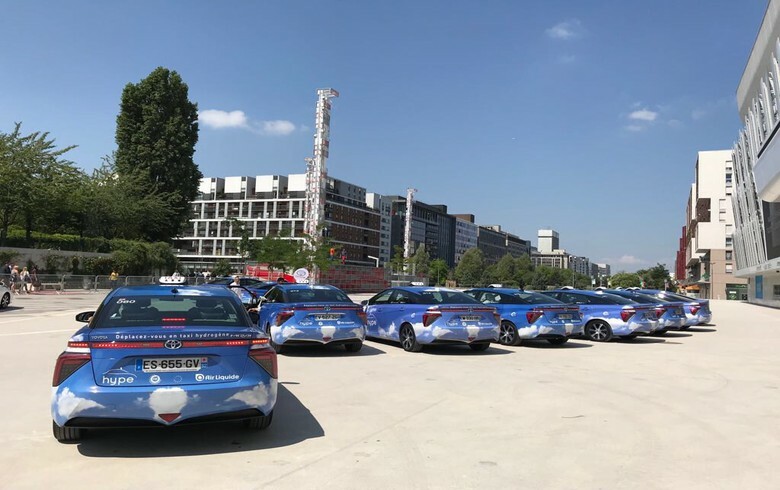 The fleet currently operates 100 taxis in the Paris region, using FCHEA member Toyota’s Mirai FCVs. As of February 2019, four hydrogen refueling stations are open to support the Hype fleet. In addition to the one located at Paris-Orly International Airport, the other stations are located near the Pont de l’Alma, in Les-Loges-en-Josas, and at Charles-de-Gaulle airport. HysetCo, a joint venture between Air Liquide, Toyota, Idex, and the Société du Taxi Électrique Parisien, formed in February 2019 and is devoted to the development of hydrogen mobility in and around Paris. In addition to expanding the existing hydrogen infrastructure in the region, the new company aims to support the expansion of the Hype fleet to 600 vehicles by 2020. Toyota has pledged to deliver an additional 500 Mirai FCVs to reach this goal. As the first company devoted to the development of hydrogen transportation in the Paris metropolitan region, HysetCo may become a prominent example of a successful transition to a clean, hydrogen-based society in France. In April 2017, French energy company McPhy launched France’s first on-site renewably-generated hydrogen station for FCVs. The FaHyence Project, a two-year collaboration between McPhy, the Communaute d’Agglomeration Sarreguemines Confluences inter-community authority, the EDF Group integrated electric company, and the European Institute for Energy Research, supported the station’s construction in Sarreguemines, France. Utilizing a high efficiency electrolyzer, the station can provide up to 25 hydrogen fills per day. In January 2019, Akuo Energy, Atawey, JcDecaux, and Galleries Lafayette, announced plans to deploy 33 refueling stations in urban and suburban areas around Paris and other cities. The new stations will help support the nearly 400 FCVs in operation throughout the country. As a part of the Last Mile project, these efforts are poised to facilitate the wide-scale deployment of a network of clean, compact, and decentralized hydrogen fueling stations across France. The country’s transportation sector has attracted international attention as it continues to implement fuel cells and hydrogen into the energy infrastructure.In February 2017, France received part of the first deployment of 100 FCVs from Hydrogen Mobility Europe, a European Union (EU) project to promote hydrogen transportation across the continent. France and the U.K. together received 60 vans with fuel cell range-extenders, powered by 5 kW fuel cell modules and capable of 320 km range, nearly double that of electric-only vans.The efficiency of these vans enables France to contribute to the reduction of emissions while improving its energy security, two of the EU’s critical goals in mitigating environmental challenges. Renault’s Kangoo ZE-H2 fuel cell range-extended van. Source H2 Mobility. Hydrogen’s versatility shows great promise as a fuel beyond light-duty FCVs to a variety of transportation applications. French retailer Carrefour opened its new supply chain distribution center in November 2018. The new facility uses 137 forklifts powered by FCHEA member Plug Power’s GenDrive hydrogen fuel cells. Utilizing the clean and efficient power of hydrogen, the retailer is helping to drive France towards a sustainable energy future, illustrating the versatility of the resource. Plug Power’s first European fuel cell deployment opened in Saint-Cyr-en-Val, France in October 2015. The project, installed at a new distribution center for fruit and vegetable logistics provider Prelocentre, became the first in Europe to exclusively use fuel cell forklifts, and confirmed France’s commitment to energy innovation. The Occitania region in France, for example, aims to become the country’s first region to deploy hydrogen trains. Utilizing Alstom Transport’s dual mode electric/hydrogen trains, typical rail energy consumption can be reduced by 20%. Occitania aims to become France’s flagship region in the integration of hydrogen into its economy, with its plans to test the trains in 2020 for a potential deployment in 2022. Through its efforts to improve infrastructure and catalyze further innovation, the region hopes to lead France on its mission to become a positive energy nation in Europe by 2050. Hydrogen is even working to reduce maritime emissions in France.In April 2017, Air Liquide announced a partnership with Energy Observer, the world’s first seagoing vessel powered solely by hydrogen and renewable energy.Hydrogen is produced on board the ship, through the electrolysis of sea water, and stored for future use to compensate for the intermittency of solar and wind energy.Toyota France provided two fuel cell systems taken from Mirai FCVs for use by the ship to generate electricity on-board using the stored hydrogen.The Energy Observer departed France in June 2017 to begin a six year international tour of 50 countries.Air Liquide hopes the success of Energy Observer will demonstrate the versatility and sustainability of hydrogen power for mobile and stationary applications. Further demonstrating the wide range of applications for hydrogen power, French energy company Engie contributed to the construction of a small power plant on Semakau Island, off the southern coast of Singapore, in May 2017. The facility utilizes solar and wind energy to power electrolysis and produce hydrogen. This hydrogen is then stored for future use to meet the varying demands of the population, when the intermittent supply of certain renewable energies is insufficient. The scalability of hydrogen-based power systems can support applications from large metropolitan areas, to small island populations that lack access to conventional electric grids. Through widespread industry innovation and significant government initiative, France has demonstrated its commitment to hydrogen and fuel cells as sources of efficient and sustainable power. The dedication to developing a hydrogen infrastructure to support unique projects is propelling France on its path to cleaner energy.